Part of being a parent is teaching your children to be responsible and respectful...of themselves, of others, and of the world we live in. It is a mindset we have to nurture. Teaching it is easy, but requires constant attention: Turn out the lights when you leave a room. Hold the door open for others. Brush your teeth twice a day. Eat all your dinner. Don't waste food. We own and live on a small farm. We keep two cows, two donkeys, a handful of chickens, and even tend our own little garden. The only meat we eat most of the year is venison, thanks to my husband and our freezer chest. All our food scraps go back to the chickens or the dog. So in my house, there's a pretty good understanding of where food comes from. But not everyone has this opportunity. When we lived in town, we didn't think twice about where our eggs came from, running to the grocery store for some tomatoes, or throwing leftovers in the trash. This coming Tuesday, October 16th, is World Food Day, and OxFam America is encouraging families to think about our global food sources. They've put together five principles - called the Grow Method - to help us all make wise decisions when it comes to improving our global food system. Did you know that this world creates enough food to feed everyone on the planet, yet nearly 1 billion people still suffer from hunger? Sadly, about 1/3 of our food gets wasted or lost between the moment it is harvested and the moment it is set on our tables. You can learn more in their short eBook, available for viewing here. You can also make a difference and support World Food Day signing up to host a World Food Day dinner discussion. 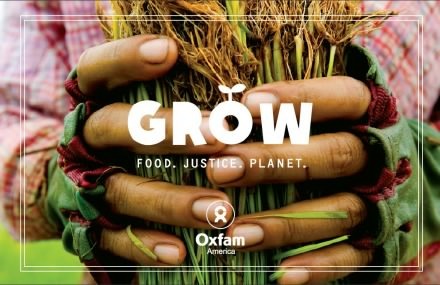 Oxfam has tons of free materials including a discussion guide, placemats, and recipe ideas from acclaimed chefs Jamie Oliver, Mary Sue Milliken, and others. Everything can be found at www.oxfamamerica.org/worldfoodday. Or if you are already a conscientious consumer and would like to share some recipes that employ one or more of the above principles, you can Share GROW method recipes on Pinterest and we’ll add them to our GROW Method Cook Book! Just tag your pin with #GROWmethod to add it. Or why not snap photos of your World Food Day meal on Instagram and tag them with #WFD2012? Then check out their site to see photos from all over the world. I'm so excited about the GROW campaign and what it's doing. I just wrote about them too and looking forward to working with them. This poverty and hunger issue has to be obliterated. Como??? So much of it is baffling to me. Thanks for sharing this.